VeriVide is the premier manufacturer of a complete line of standard visual assessment instruments. 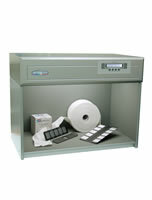 VeriVide visual colour assessment cabinets have been most widely used around the world. All VeriVide products are made in CEE to ensure the highest quality level. VeriVide fluorescent daylight meets approximating to a CIE Metameric Index (MI) Grade A; the best fluorescent D65. In order to defend against increasing number of copycats & protect VeriVide customers' interests, VeriVide supplies all VeriVide products with professional certificates showing that their conformity & quality in strictly line with ISO9000. To avoid buying faking VeriVide products, Gar-Tex Testing Equipment Ltd, VeriVide's firm business partner, is highly recommended if you like to buy VeriVide products in Asia.